Background and objectives Acute renal impairment is observed in 11%–23% of patients with congenital thrombotic thrombocytopenic purpura (TTP) and deficiency of a disintegrin and metalloprotease with thrombospondin motifs 13 (ADAMTS13, a metalloprotease that cleaves von Willebrand factor [VWF] multimers), a substantial percentage of whom develop CKD during follow-up. Design, setting, participants, & measurements Here we investigated whether, in 18 patients with congenital recruited from 1996 to 2013 who fulfilled inclusion criteria, acute renal involvement occurred during bouts segregated with lower secretion and activity levels of ADAMTS13 mutants. We performed expression studies and a sensitive recombinant VWF (rVWF) A1-A2-A3 cleavage test (detection limit, 0.78% of normal ADAMTS13 activity). Results A higher risk of acute renal impairment during bouts was observed in patients with childhood (<18 years) onset (odds ratio [OR], 24.6 [95% confidence interval (CI), 1.11 to 542.44]) or a relapsing (≥1 episode per year) disease (OR, 54.6 [95% CI, 2.25 to 1326.28]) than in patients with adulthood onset or long-lasting remission, respectively. Whatever the age at onset, patients with acute renal impairment had mutations different from those in patients without renal involvement. Moreover, mutations in patients with acute renal impairment compared with those in patients without renal involvement caused lower in vitro rADAMTS13 secretion (1.33% versus 12.5%; P<0.001) and residual activity (0.11% versus 3.47%; P=0.003). rADAMTS13 secretion ≤3.75% and residual activity ≤0.4% best discriminated patients with renal impairment (receiver-operating characteristic curve sensitivity, 100% and 100%; specificity, 100% and 83.3%, respectively; logistic regression OR, 325 [95% CI, 6 to 18339] and 91.7 [95% CI, 3.2 to 2623.5], respectively). All mutations found in patients with childhood onset or relapsing disease were associated with acute renal impairment during bouts, confirming the link between acute renal impairment and early onset or a relapsing course. ADAMTS13 activity levels in vivo, measured in patients’ serum by rVWF A1-A2-A3 cleavage test, correlated with in vitro rADAMTS13 mutant activity (r=0.95; P<0.001). Conclusions In congenital TTP, renal impairment and relapsing disease might be predicted by measurements of in vitro rADAMTS13 secretion and activity levels and in vivo serum ADAMTS13 activity. Thrombotic thrombocytopenic purpura (TTP) is a rare disease characterized by thrombocytopenia, microangiopathic hemolytic anemia, fever, and widespread microvascular thrombi resulting in multiorgan dysfunction (1). In the microvasculature of patients with TTP, thrombi rich in platelets and von Willebrand factor (VWF) develop during the acute phase (2). TTP is associated with deficiency of VWF-cleaving protease a disintegrin and metalloprotease with thrombospondin motifs 13 (ADAMTS13) and with appearance in the circulation of ultra-large molecular weight VWF (ULVWF) multimers (3). In healthy individuals, ULVWF multimers do not normally circulate because they are reduced by ADAMTS13 into smaller multimers soon after their secretion (4). In absence of ADAMTS13, ULVWF multimers accumulate in plasma and promote the formation of thrombi in the microvasculature, leading to organ dysfunction (1). ADAMTS13 deficiency in TTP may be acquired (due to inhibitory antibodies) or may be congenital (cTTP) (due to mutations in the corresponding gene) (5). To date, >150 different ADAMTS13 mutations have been identified (6). In vitro studies showed that most mutations lead to impaired secretion from cells, and, when the mutant protein is secreted, the proteolytic activity is greatly reduced (7). Neurologic dysfunction is a common finding in TTP and has historically been used as a criterion to differentiate TTP from atypical hemolytic uremic syndrome (HUS), in which AKI is a prominent feature (8). However, acute and chronic renal dysfunction may be seen in TTP (9,10). Data from the literature indicate that AKI at first episode is observed in up to 59% of adult patients with acquired TTP (11), while 11%–23% of patients with cTTP have episodes of AKI during bouts (12,13). Over the long term, approximately 25% and 11% of patients with acquired TTP and cTTP, respectively, have been reported to have CKD (11,12). Studies on recombinant ADAMTS13 mutants (14,15) or residual plasmatic ADAMTS13 activity (16) have proposed that ADAMTS13 genotype may influence the severity of cTTP phenotype defined by early onset, frequent relapses, and the need for plasma prophylaxis. However, no study has so far investigated the clinical and genetic factors that might account for renal impairment in patients with cTTP who develop renal manifestations at presentation or during the course of their disease (12). In this study we investigated the prevalence of renal impairment among patients with cTTP in relation to the clinical manifestations of the disease and the specific ADAMTS13 genetic abnormalities. We expressed seven new recombinant ADAMTS13 proteins carrying mutations found in 18 patients with cTTP and correlated in vitro secretion levels and residual activity of mutants with patients’ clinical parameters, and in particular with acute renal impairment during bouts. We also set up a sensitive method to evaluate very low serum ADAMTS13 activity levels in order to investigate whether in vivo residual ADAMTS13 activity in patients with cTTP correlated with in vitro activity of the corresponding recombinant mutants. All patients with TTP referred to the International Registry of HUS/TTP (http://www.marionegri.it/en_US/home/research_en/ricerca_clinica_en/registri_patologia_en/seu_ppt_registry) and to the Milan TTP Registry (http://www.ttpdatabase.org), started in 1996 and 2007, respectively, were evaluated for inclusion in this study. Inclusion criteria were: (1) diagnosis of cTTP, (2) clinical history recorded since onset, (3) at least one episode of TTP requiring plasma infusion, (4) homozygous or compound heterozygous ADAMTS13 mutations, and (5) complete follow-up. We excluded four patients with cTTP without an identified mutation or with only a single heterozygous mutation and one patient with incomplete follow-up. Atypical HUS-associated complement genes (CFH, MCP, CFI) were sequenced in patients manifesting—at disease onset or during relapses—renal impairment as defined by (1) AKI, the need for dialysis, and/or urinary abnormalities (hematuria and/or proteinuria) in patients without previous renal abnormalities or (2) worsening renal function in patients with previous renal dysfunction. AKI was diagnosed when serum creatinine was >0.5 mg/dl in 1- to 5-year-old children, >0.8 mg/dl in 5- to 10-year-old children, and >1.2 mg/dl in children >10 years and in adults or when serum urea was >16 mg/dl in children up to 1 year of age and >20 mg/dl in the other patients. ADAMTS13, CFH, MCP and CFI were directly sequenced (17,18). rADAMTS13 mutants were expressed in HEK293 cells (19,20). ADAMTS13 activity in cell supernatant and in patients' serum was measured by collagen-binding assay (CBA), fluorescence resonance energy transfer (FRETS) recombinant VWF (rVWF) 73, and cleavage of rVWF A1-A2-A3 (21,22). Details about TTP diagnosis and methods are provided in the Supplemental Material. Categorical data were analyzed with chi-square or Fisher exact tests. Nonparametric's Spearman rank correlation test was used to assess the statistical dependence of two variables. Univariate logistic regression analyses were performed to assess the odds ratio (OR) and 95% confidence interval (CI) for categorical variables to influence a dichotomic dependent variable. The normal distribution of data were tested by the D'Agostino and Pearson omnibus normality test. ANOVA was performed to compare in vitro rADAMTS13 secretion and residual activity levels among patient subgroups. Receiver-operating characteristic (ROC) curve analyses were performed to assess in vitro rADAMTS13 secretion and residual activity levels that could distinguish patients with renal impairment during bouts with the highest sensitivity and specificity. The criterion corresponding with the highest Younden index was used as a cutoff to categorize the two covariates. Statistical significance was set at P≤0.05. The analyses were performed using MedCalc and GraphPad Prism softwares. Nineteen patients with cTTP (13 with familial TTP and 6 without a family history) from the International Registry of HUS/TTP (n=16) and the Milan Registry (n=3) fulfilled the inclusion criteria. Clinical histories of patients included in the study are provided in the Supplemental Material. Among them, patients manifesting acute renal impairment during bouts were screened for CFH, MCP, and CFI; one of these (F45#002), who carried the heterozygous missense p.S890I CFH variant (17), was excluded from further analyses. The characteristics of the cohort are summarized in Table 1. Age at disease onset ranged from neonatal period to 35 years. In 8 of 18 patients, TTP manifested in childhood (<18 years), whereas the others developed the disease at the end of the second or during the third or fourth decades of life. The most frequent triggering events were pregnancy in women and infections in men and children. During bouts, 8 of 18 patients developed both renal and neurologic symptoms, 4 manifested only renal impairment, and 6 had only neurologic symptoms. Patients with childhood onset had fewer neurologic symptoms (50%) and a higher prevalence of acute renal impairment during bouts (100%) than those manifesting the disease in adulthood (neurologic involvement, 100%; P=0.02; renal impairment, 40%; P=0.01) (Supplemental Table 1 and Table 1). Consistently, by logistic regression analysis, childhood onset was associated with a lower risk of neurologic symptoms (OR, 0.08 [95% CI, 0.002 to 1.08]; P=0.06) and a higher risk of manifesting acute renal impairment (OR, 24.6 [95% CI, 1.1 to 542.4]; P=0.04) (Table 2) during bouts. The number of episodes varied from 1 to >100. All patients were treated with fresh frozen plasma (FFP) infusion (usually 30–40 ml/kg on day 1, then 10–20 ml/kg per day) during acute bouts, until remission was achieved, to provide ADAMTS13 protein and arrest spontaneous microangiopathy (2,23,24). Ten of 18 patients (8 of 8 with childhood onset and 2 of 10 with adulthood onset) were treated with regular FFP (rFFP) prophylaxis to maintain remission (Table 1). Only 1 of the 8 children received preventive plasma therapy as soon as after the first episode, a procedure strongly encouraged by pediatric guidelines (6). The frequency of relapses (number of episodes per year, considering the number of episodes from disease onset to the last follow-up or to the start of rFFP prophylaxis) ranged from 0.1 to 8 episodes per year, with a median of 1 (95% CI, 0.33 to 1.99]) (Supplemental Figure 1 and Table 1) and negatively correlated with age at onset. Indeed, a higher number of relapses per year was recorded in patients with earlier onset (r=−0.65; P=0.005). On the basis of the relapse frequency, we categorized the patients with ≥1 episode per year (over median value) into the relapsing group (n=10) and those with <1 episode per year (n=8) (under median value) into the long-lasting remission (LLR) group. Patient F1627#873 started rFFP prophylaxis soon after the first episode, and she was included in the relapsing group according to her family history. The incidence of acute renal impairment during bouts, either at onset or during relapses, was greater in the relapsing (100%) than in the LLR (25%) group (P=0.001). Consistently, the OR for acute renal impairment during bouts in relapsing patients was 54.6 (95% CI, 2.3 to 1326.3; P=0.01) (Table 2). Interestingly, all but 2 patients who developed acute renal impairment during bouts were then given rFFP prophylaxis to prevent relapses, while all those without renal symptoms received plasma only during acute episodes (P=0.001). At the last follow-up, 12 patients were in remission. Of the remaining 6 patients, all experiencing acute renal impairment during bouts, 5 developed different degrees of CKD (Supplemental Table 2); of these, 1 died after 5 years of long-term dialysis and 1 also had neurologic sequelae. The sixth patient had only neurologic sequelae (Supplemental Material and Table 1). Of 18 patients, 10 had previously been screened for ADAMTS13 mutations by our groups (Table 1) (16,17,19,20,25,26). Here we identified the genetic ADAMTS13 defect in the other 8 patients (R002, F1518#728, F1519#728, F1627#873, F1628#873, F769#239, F1116#239, and R564). A detailed description of identified mutations is reported in Table 1 and in the Supplemental Material. By in vitro expression studies we functionally characterized the effects on rADAMTS13 proteins of the four novel mutations and the p.I143T, p.D235Y, and p.R1095Q not previously characterized. Wild-type (WT) rADAMTS13 and mutants were transiently expressed in HEK293T cells. 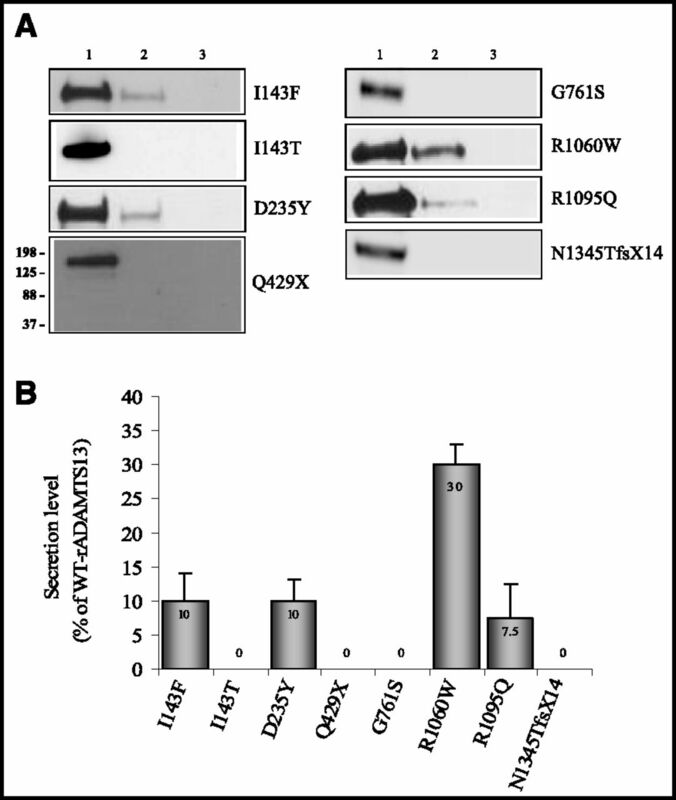 Western blot analyses on supernatants of cells expressing WT-rADAMTS13 revealed a 180- to 190-kDa band (Figure 1A). All mutations caused severely reduced or absent rADAMTS13 secretion in the supernatants (I143F, 10%; D235Y, 10%; R1095Q, 7.5%; I143T, Q429X, G761S, and N1345TfsX14, no secretion) (Figure 1, A and B, and Table 3); however, these mutants were synthesized within the cells in equal amounts compared with WT-rADAMTS13, as evidenced by cell lysate analysis. The three mutants with detectable secretion showed impaired or no protease activity in the rVWF A1-A2-A3 cleavage test, when supernatants containing equal quantities of mutant or WT recombinant proteins were used (I143F, 5%; D235Y, R1095Q, no activity) (Table 3). Reduced or absent secretion of new rADAMTS13 mutants. (A) Representative Western blot analysis of rADAMTS13 proteins in transfected HEK293T cells supernatant. Lane 1: wild-type (WT) rADAMTS13; lane 2: mutant rADAMTS13; lane 3: untransfected cells. (B) Error bars are mean±SD secretion levels (n=3 determinations) for each mutant rADAMTS13 protein reported as a percentage of WT-rADAMTS13. rADAMTS13, recombinant a disintegrin and metalloprotease with thrombospondin motifs 13. The variants p.V88M, p.Q97fsX31, p.C977W+A978_R979del, p.R1123C, p.R1219W, p.G1239V, and p.E1382RfsX6 were previously described and functionally characterized by our groups (Table 3) (19,20,25). The p.R1060W has already been expressed by Camilleri (27) and Tao (28) and colleagues; however, these investigators reported different levels of secretion (<5% and 11.4%, respectively) and activity (fully active and 35% active, respectively). Thus, we decided to verify the effect of this mutation on protein secretion and activity by expression studies. We found that the R1060W mutant has 30% secretion and 46% activity in vitro (Figure 1, A and B, and Table 3). Discrepancies between present and published results could be due to the different cell types used for expression studies and the different methods used to evaluate rADAMTS13 antigen and activity levels (27,28). The c.82insT causes a frameshift interrupting protein synthesis at amino acid 138 (p.W28LfsX111). The resulting protein completely lacks the metalloprotease and the subsequent domains; thus, we arbitrarily set both secretion and activity levels at 0% (Table 3). The rVWF A1-A2-A3 cleavage test results were confirmed by CBA and FRETS-rVWF73 (Supplemental Table 3). The mutations identified in patients with acute renal impairment were different from those of patients without renal involvement, although no clustering or mutation hotspots were found in the two groups (Supplemental Figure 2). We then investigated whether in vitro secretion levels or residual protease activity of rADAMTS13 mutants correlated with patients’ clinical parameters. Patients manifesting acute renal impairment during bouts had mutations determining lower in vitro rADAMTS13 secretion (P<0.001) and residual activity (P=0.003) levels than patients without renal involvement (Figure 2A and Table 4). By using ROC curve analyses, we assessed that in vitro rADAMTS13 secretion levels ≤3.75% and residual rADAMTS13 activity levels ≤0.4% best discriminated patients with acute renal impairment during bouts with a sensitivity of 100% for both covariates, and a specificity of 100% and 83.3%, respectively (Figure 3, A and B). Consistently, the ORs to manifest acute renal impairment during bouts for patients carrying mutations characterized by an in vitro rADAMTS13 secretion ≤3.75% or residual activity levels ≤0.4% were 325 (95% CI, 6 to 18,339) and 91.7 (95% CI, 3.2 to 2623.5), respectively (Table 2). 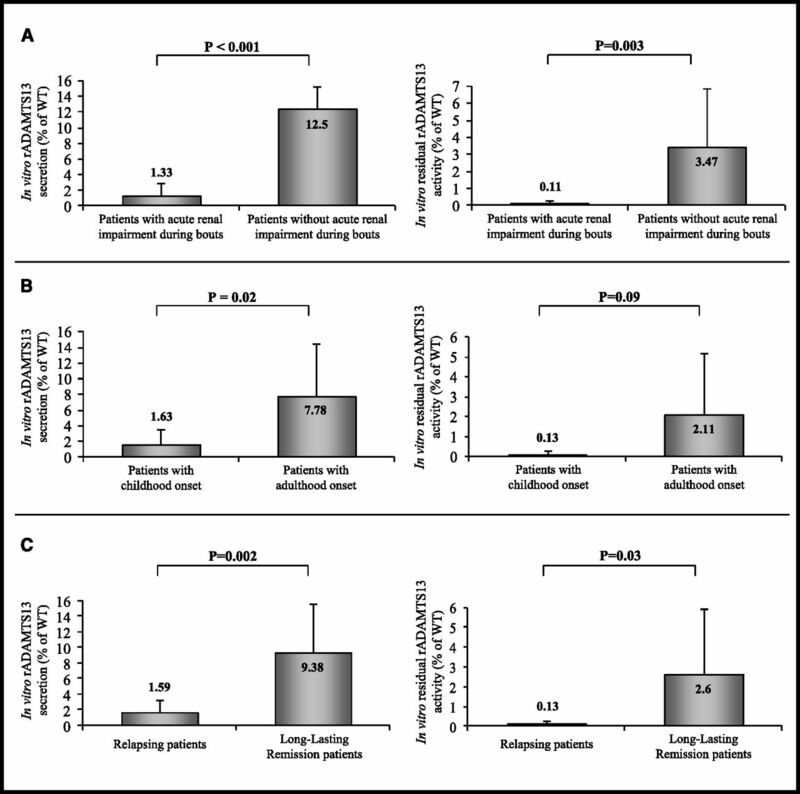 Differences of in vitro secretion (left) and residual activity levels (right) of rADAMTS13 proteins carrying mutations found in patients with acute renal impairment during bouts versus patients without acute renal impairment during bouts (A), in patients with childhood versus adulthood onset (B), and in patients with relapsing disease versus long-lasting remission (C). Residual rADAMTS13 activity in cell supernatant was calculated on the basis of in vitro functional studies multiplying the activity of each mutant rADAMTS13 for the corresponding percentage of secretion. In compound heterozygous patients, half the percentage of secretion was considered for each mutant and the sum of residual activity of the two mutants has been calculated. Data are expressed as percentage of wild-type rADAMTS13 secretion or activity and are reported as mean±SD. Error bars are mean±SD. rADAMTS13, recombinant a disintegrin and metalloprotease with thrombospondin motifs 13; WT, wild type. 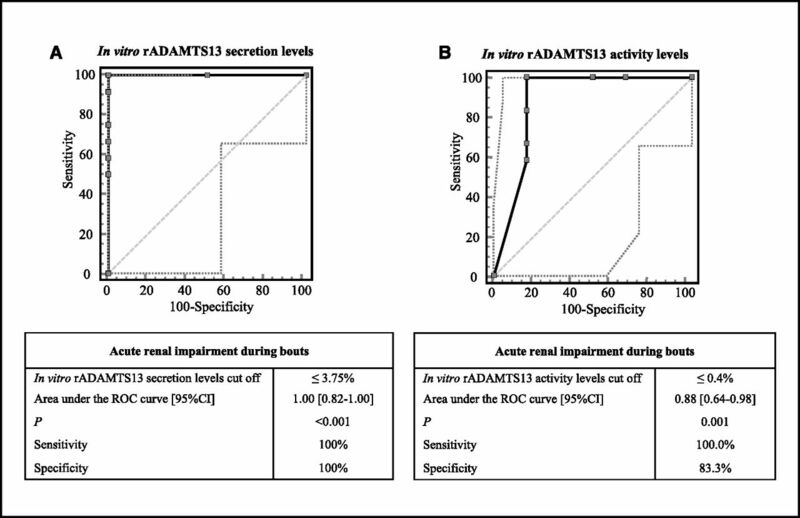 Receiver-operating characteristic (ROC) curve analyses of in vitro rADAMTS13 secretion (A) and residual activity (B) levels of mutations found in patients developing or not developing acute renal impairment during bouts. Dotted lines in the graphs represent the 95% confidence bounds. rADAMTS13, recombinant a disintegrin and metalloprotease with thrombospondin motifs 13; 95% CI, 95% confidence interval. Interestingly, all mutations found in patients with childhood onset or relapsing disease were also associated with acute renal impairment during bouts, confirming the link between acute renal impairment and early onset or a relapsing course. Consistently, mutations carried by patients with childhood onset resulted in lower in vitro rADAMTS13 secretion (P=0.02) and activity (P=0.09) levels than those of patients with adulthood onset (Figure 2B). Similarly, mutations associated with relapsing disease had significantly lower percentages of in vitro rADAMTS13 secretion (P=0.002) and activity (P=0.03) levels than mutations carried by LLR patients (Figure 2C). We then verified whether residual protease activities of rADAMTS13 mutants calculated in vitro correlated with in vivo ADAMTS13 activity levels in patients’ serum. Because most patients had protease activity below the detection limits of CBA and FRETS-rVWF73 (Table 4), we set up a more sensitive assay based on the cleavage of the rVWF A1-A2-A3 by patients’ serum, with a detection limit of 0.78% protease activity in normal human serum (Supplemental Figure 3 and Supplemental Methods). Most patients with acute renal impairment during bouts were receiving long-term plasma infusion every 2–4 weeks. We tested only the 3 patients from whom a serum sample could be collected in remission (>1 month from the last plasma infusion; Table 4), before starting rFFP prophylaxis, to avoid overestimation of protease activity due to exogenous ADAMTS13 supplied by plasma treatment. We also tested all patients without acute renal impairment during bouts (Table 4). In the 9 patients considered overall, in vivo residual ADAMTS13 activity levels with the rVWF A1-A2-A3 cleavage test correlated with residual protease activity calculated in vitro with the corresponding rADAMTS13 mutants (r=0.95; P<0.001). No ADAMTS13 activity could be detected by rVWF A1-A2-A3 cleavage test in sera from the 3 tested patients with acute renal impairment during bouts, while in 5 of 6 patients without renal impairment in vivo residual ADAMTS13 activity was >0.78% (Figure 4 and Table 4). Recombinant von Willebrand factor (rVWF) A1-A2-A3 cleavage test by ADAMTS13 in patients’ serum. (A–C) Representative Western blot analyses of rVWF A1-A2-A3 cleaved by ADAMTS13 in patients’ serum. For each panel a standard curve obtained using serial dilutions of normal human serum pool characterized by known ADAMTS13 activity levels is shown. (D) Mean of ADAMTS13 activity in patients’ serum (n=3 experiments for each patient) obtained from densitometric analyses on Western blot. ADAMTS13, a disintegrin and metalloprotease with thrombospondin motifs 13; NHS, normal human serum; TTP, thrombotic thrombocytopenic purpura. In the present study, patients with cTTP and acute renal impairment during bouts were characterized by earlier age at first TTP episode and relapsing course of the disease. Indeed, patients with childhood onset or relapsing course had a 25-fold and 55-fold higher risk of manifesting acute renal impairment than patients with adulthood onset or LLR course, respectively. Here we also found that patients with acute renal manifestations during bouts had unique ADAMTS13 mutations, different from those identified in patients without acute renal symptoms, and leading to very low or undetectable protease secretion and activity levels. All 18 consecutive patients had ADAMTS13 activity levels <6% by the CBA test, without inhibitory antibodies, which is consistent with the diagnosis of cTTP. However, in a recent study that included 9 of the patients described here, 90% of patients with cTTP had residual plasmatic ADAMTS13 activity ranging between 0.5% and 6.77%, as measured by a more sensitive surface-enhanced laser desorption/ionization–time-of-flight (SELDI-TOF) mass spectrometry test; activity levels negatively correlated with phenotype severity (16). In the same study we also reported the novel finding that patients with early onset or more frequent relapses had ADAMTS13 activity levels <1.61% and <2.74%, respectively (16). 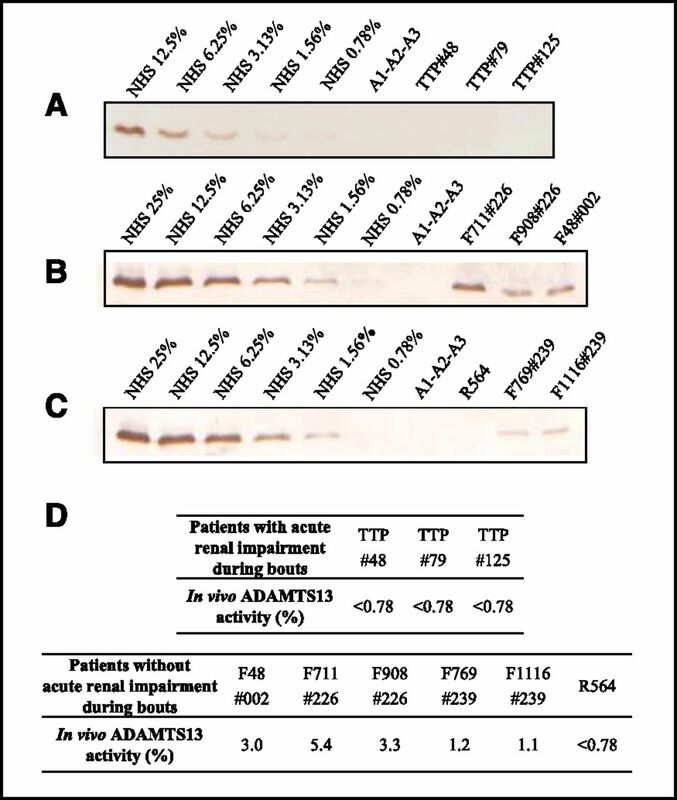 Here we additionally characterized patients with acute renal impairment during bouts as per their specific ADAMTS13 mutations and their association with secretion and residual protease activity levels. For this purpose we set up a sensitive rVWF A1-A2-A3 cleavage assay and found that secretion and residual activity levels of the 16 expressed rADAMTS13 mutants ranged from 0% to 30% and from 0% to 13.8%, respectively. Seven of these mutations have not been previously characterized. Patients experiencing acute renal impairment during bouts carried mutations associated with lower rADAMTS13 secretion and activity levels than those of patients without renal involvement; notably, 42% of the former developed CKD during follow-up. ROC curve analyses showed that in vitro rADAMTS13 secretion ≤3.75% and residual activity levels ≤0.4% predicted renal impairment during bouts with 100% sensitivity. Altogether these findings might indicate that the kidney microvasculature has a better capacity to adapt to discrete levels of ADAMTS13 deficiency than the microvasculature of the brain or other organs. However, in the context of very low levels of the protease, microthrombi appear to form even in renal glomerular capillaries. Because the kidney makes a significant contribution of tissue plasminogen activator (tPA) to the circulation (29,30), we speculate that the high fibrinolytic activity of tPA on kidney microvasculature determines protection from thrombosis also in the presence of low ADAMTS13 activity levels. This possibility is supported by published data that plasmin can detach platelets anchored in a VWF-dependent manner to the collagen matrix or inner layers of arteries (31), which led to the hypothesis that both low ADAMTS13 and low tPA activities are required to trigger TTP bouts (32). Nevertheless, when ADAMTS13 deficiency is extremely severe, tPA activity may be not enough to offset the prothrombotic effect of locally formed ULVWF multimers in promoting glomerular microthrombi. Another interesting observation of this study is that very low in vitro rADAMTS13 secretion/activity levels, childhood cTTP onset, and acute renal impairment during bouts were all associated with a relapsing course of the disease. Identification of patients at risk of recurrent disease based on the above parameters could help clinicians to make decisions about starting early rFFP prophylaxis with the aim of preserving renal and also neurologic wellness. Expression studies of rADAMTS13 mutants are time-consuming and expensive and are not performed on a routine basis. To overcome these limitations we set up a test for in vivo evaluation of very low levels of ADAMTS13 activity in patients’ serum based on rVWF A1-A2-A3 cleavage. This method has a detection limit similar to that of SELDI-TOF mass spectrometry (16); however, it may be more easily accessible to routine clinical laboratories. The finding that ADAMTS13 activity values in patients’ serum significantly correlated with those calculated by in vitro expression studies points to the rVWF A1-A2-A3 cleavage test as a sensitive method for testing the functional consequences of ADAMTS13 mutations in vivo in patients with cTTP. In conclusion, our data indicate that secretion and residual activity levels of rADAMTS13 mutants evaluated in vitro predict the risk of acute renal involvement in patients with cTTP and highlight the intrinsic capability of renal microvasculature to counteract the prothrombotic milieu associated with ADAMTS13 deficiency, unless residual activity levels fall under a critical cutoff. Detection of residual ADAMTS13 activity in vivo in patients’ serum with sensitive assays, like that here presented or the recently published FRETS-rVWF71 (33), could be helpful in predicting the disease clinical manifestation and, in particular, a relapsing course with the risk of permanent neurologic and renal sequelae. M.N. has received honoraria from Alexion Pharmaceuticals for giving lectures and participating in advisory boards. None of these activities has had any influence on the results or interpretation in this article. G.R. has consultancy agreements with AbbVie, Alexion Pharmaceuticals, Bayer Healthcare, Reata Pharmaceuticals, Novartis Pharma, AstraZeneca,Otsuka Pharmaceutical Europe, and Concert Pharmaceuticals (no personal remuneration is accepted; compensations are paid to his institution for research and educational activities; none of these activities has had any influence on the results or interpretation in this article). The authors thank Fondazione ART per la Ricerca sui Trapianti ONLUS (Milano, Italy) for the fellowships of E.R. and F.B. ; M. Alberti and Drs R. Piras, A. Sorosina, and E.Valoti (IRRCS–Istituto di Ricerche Farmacologiche “Mario Negri”, Ranica, Bergamo, Italy) for complement gene screening; Dr. Z.M. Ruggeri (Scripps Research Institute, La Jolla, CA) for providing monoclonal antibody against the VWF carboxyl-teminal; S. Gamba (IRRCS–Istituto di Ricerche Farmacologiche “Mario Negri”, Ranica, Bergamo, Italy) for the management of patients and biological samples; Dr R. Paolini (Azienda Ospedaliera of Rovigo, Italy), Dr C. Martinez (University of Murcia, Spain), Dr. E. Rossi (Luigi Sacco Hospital, Milano, Italy), Dr. M. Schiavoni (Policlinico Consorziale Hospital, Bari, Italy), and Dr. G. Kucharska (Chorzowskie Centrum, Chorzow, Poland) for providing detailed clinical information on families 239, 226, 002, 019, and 728; Dr G. Garozzo (“M.P. Arezzo” Hospital, Ragusa, Italy), Dr. P. Ruggenenti (Azienda Ospedaliera Papa Giovanni XXIII, Bergamo, Italy), Dr R. Coppo (Regina Margherita Hospital, Torino, Italy), and Dr. P. Riegler (Azienda Ospedaliera of Bolzano, Italy) for providing detailed clinical information on patients R564, R012, R002 and R1057, Dr. A. Metin (Ankara Children's Hematology Oncology Training and Research Hospital, Turkey), and Dr. A. Gurgey (Division of Pediatric Hematology, Hacettepe University, Turkey) for providing detailed clinical information on patient TTP125 and Professor P.M. Mannucci (Angelo Bianchi Bonomi Hemophilia and Thrombosis Center, IRCCS Fondazione Ca’ Granda Ospedale Maggiore Policlinico, Department of Pathophysiology and Transplantation, Università degli Studi di Milano and Luigi Villa Foundation, Milan, Italy) for useful discussion; and Dr. Kerstin Mierke for manuscript editing. This article contains supplemental material online at http://cjasn.asnjournals.org/lookup/suppl/doi:10.2215/CJN.01700215/-/DCSupplemental.